Since the conductor and composer Julian Wachner became the director of music and arts at Trinity Wall Street in September 2010 he has pursued at least two distinct agendas. He has increased the amount of contemporary music performed by the church’s admirable Trinity Choir, bolstering that move by inaugurating a new instrumental ensemble, Novus NY. 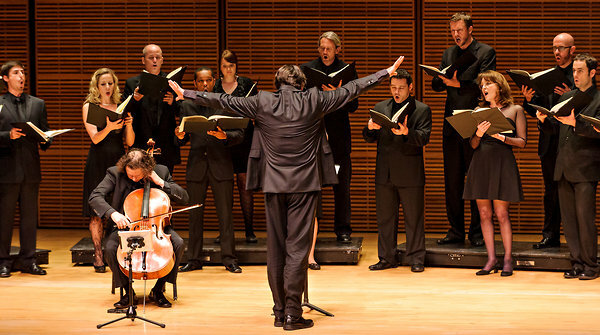 He has also taken steps to make the choir more visible outside its native habitat of Lower Manhattan, like mounting one of its cherished annual performances of Handel’s “Messiah”at Alice Tully Hall last year. On Thursday evening those two initiatives merged when Mr. Wachner led the Trinity Choir in a concert at Zankel Hall that consisted almost entirely of contemporary works. The program proved that the choir is up to Mr. Wachner’s challenges. In music that allowed no margin for error with regard to intonation and rhythm, its work was airtight. Singing in acoustics far different from those to which it is accustomed, the ensemble was superb. All those qualities were tested immediately in the first work on the program, “Six Choral Settings” by Laura Elise Schwendinger, which knit poetry concerned with life and love into dense polyphonic webs. Ms. Schwendinger’s coolly beguiling tone seemed at odds with some of the more heated sentiments in the texts she chose, particularly the headier ecstasies in three selections from the Song of Solomon. Her abstraction was best suited to more cosmic mysteries pondered by Milton, Kukai and Rumi; in the two last songs Ms. Schwendinger added brooding asides for the cellist Matt Haimovitz, a guest soloist. In “San,” for cello and tape, the inventive composer Du Yun evoked the sounds of a qin (pronounced chin; an ancient Chinese zither) with broad glissandos and bone-dry plucks, while also contemplating notions of distance, mortality and memory through grainy, gritty outbursts of noise and keening echoes. Mr. Haimovitz, a musician who positively thrives on challenge, gave a gripping account. Mr. Wachner’s “Rilke Songs,” six settings of poems about animals real and legendary, showed an imaginative flair for allusive text setting, evoking a caged panther’s restless stalking and contrasting a swan’s clumsy gait on land with its elegance in water. The chorus handled the silken complexities of Mr. Wachner’s close harmonies gracefully. Five handsomely rendered spirituals opened the program’s second half, with astonishing solo singing by Eric Brenner, billed as a soprano, in “There Is a Balm in Gilead.” It was a fitting preface to Luna Pearl Woolf’s “Après Moi, le Déluge,” a strikingly allusive concerto for cello and chorus that movingly reflects on the devastation wrought by Hurricane Katrina. Somber, sardonic and bluesy, the episodic work received an impassioned account, with soulful solo work by Mr. Haimovitz, the soprano Martha Cluver and the bass-baritone Dashon Burton. This entry was posted in News and tagged apres moi, Luna Pearl Woolf, Matt Haimovitz. Bookmark the permalink.